Watching the students receive their certificates at Northrop. 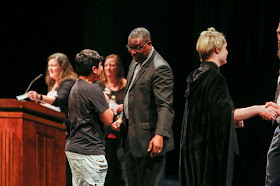 Last week I watched 175 middle school students cross the Northrop stage. They were the 8th-grade class of Northeast Middle School (NEMS) in Minneapolis, receiving their completion certificates. Over the course of the semester these students had worked with Gender, Women, & Sexuality Studies (GWSS) Professor Jigna Desai and GWSS Research Associate Kari Smalkoski and their undergraduate students on a unique project: The Minnesota Youth Story Squad. Meeting once a week, the undergraduate mentors and Dr. Jigna and Dr. Kari (as they are known to the students) would lead the 8th graders in discussions ranging from social justice to bullying and ultimately led the students in the creation of their own personal digital stories. During the ceremony at Northrop the students debuted their stories in front of their friends and families. The images ranged from silly memes to carefully hand-drawn illustrations. The videos covered topics from immigration to stereotypes. All were poignant and dynamic. It was a powerful reminder of the necessity to engage with not only with K-12 partners, but specifically those working in middle school. When universities work with K-12 entities, it is often on either end of the spectrum: before the 3rd grade and during high school. But those middle years are filled with innumerable changes -- physical, emotional, and social -- and are crucial to a student’s ultimate academic and personal success. The Minnesota Youth Story Squad is a compelling example of the impact that we in higher education can have in those challenging years. And personally, it was affirmation of the great creativity combined with seriousness combined with fun exhibited by young students. Generation Z can get a bad rap--that they never look up from their phones, that they don’t know or care about what’s going on in the world around them. But that’s not what I saw at Northrop -- or at their school, which I visited a few months back. On the big screen at Northrop I saw powerful storytellers discussing vital social topics. And onsite I saw students running an aquaponics lab, students sharing their thoughts about what challenges them and what they hope for, and students creatively engaged in their work. congratulates students as they receive their certificates. 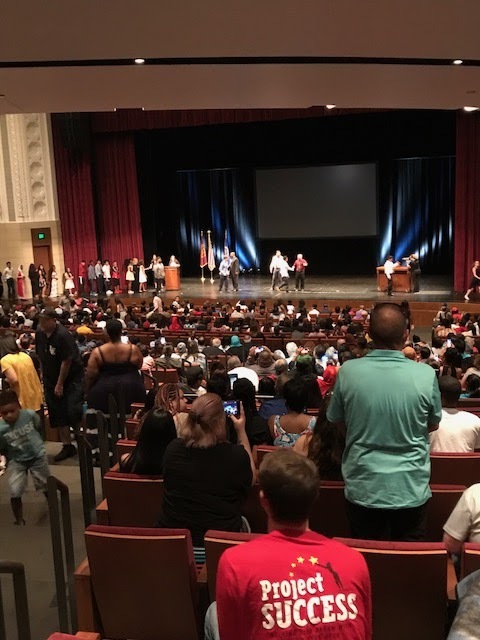 As I looked around at the parents with bouquets of flowers and the entire rows of people who cheered when their student’s name was called, I was reminded of the importance of fostering and celebrating success at every stage. As was emphasized by Northeast's Principal, Vernon Rowe, these students were not just the class of 2022 (when they'll graduate high school) but we very much hope they'll be the class of 2026 -- be it here at the U or elsewhere. The project with Northeast Middle School is a great example of reciprocal engagement. Our faculty, students, and staff took their dedication, determination, and drive to this community partner and learned what would be most meaningful for NEMS students. And then they worked collaboratively with the teachers and staff at NEMS to make it happen. I have no doubt that in that room there were many lives changed by the confidence-building experience of telling their digital stories and the pride of being on campus and walking across the Northrop stage. I'm proud that CLA was a driving force in this important work and felt fortunate to have a chance to see it up close. For more on this impressive project, visit their webpage, their Instagram page, and watch this KSTP story.